For the condiment, see Worcestershire sauce. For the County Council, see Worcestershire County Council. 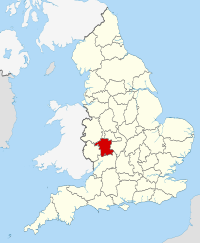 Worcestershire (/ˈwʊstərʃər/ ( listen) WUUS-tər-shər, /-ʃɪər/ -⁠sheer; written abbreviation: Worcs) is a county in the West Midlands of England. Between 1974 and 1998, it was merged with the neighbouring county of Herefordshire as Hereford and Worcester. The cathedral city of Worcester is the largest settlement and county town. Other major towns in the county include Bromsgrove, Droitwich, Evesham, Kidderminster, Malvern, Redditch, and Stourport-on-Severn. The north-east of Worcestershire includes part of the industrial West Midlands; the rest of the county is largely rural. The county is divided into six administrative districts: Worcester, Redditch, Wychavon, Malvern Hills, Wyre Forest, and Bromsgrove. The hand axe discovered in 1970s in Hallow. Potentially the first Early Middle Palaeolithic artefact from the West Midlands. The geographical area now known as Worcestershire was first populated at least 700,000 years ago. The area became predominantly agricultural in the Bronze Age, leading to population growth and more evidence of settlement. By the Iron Age, hill forts dominated the landscape. Settlement of these swiftly ended with the Roman occupation of Britain. The Roman period saw establishment of the villa system in the Cotswalds and Vale of Evesham. Droitwich (Salinae) was probably the most important settlement in the county in this period, due to its product of salt. There is also evidence for Roman settlement and industrial activity around Worcester and King's Norton. In 1642, the Battle of Powick Bridge was the first major skirmish of the English Civil War. The county suffered from being on the Royalist front line, as it was subject to heavy taxation and the pressing of men into the Royalist army, which also reduced its productive capacity. The northern part of the county, which was already a centre of iron production, was important for military supplies. Parliamentarian raids and Royalist requisitioning both placed a great strain on the county. There were tensions from the participation of prominent Catholic recusants in the military and civilian organisation of the county. Combined with the opposition to requisitioning from both sides, bands of Clubmen formed to keep the war away from their localities. The Battle of Worcester in 1651 effectively ended the third civil war. There was little enthusiasm or local participation in the mostly Scottish Royalist army, whose defeat was widely welcomed. Nevertheless, Parliamentarian forces ransacked the city of Worcester, causing heavy damage, looting and destruction of property. Around 10,000 mostly Scottish prisoners were sent into forced labour in the New World or fen drainage schemes. The small bands of Scots that fled into Worcestershire's countryside were attacked by local forces and killed. Local government in Worcestershire has changed several times since the middle of the 19th centiry. Birmingham's continuous expansion has been a major cause of Worcestershire's fluid boundary changes and associated housing issues. The district of Balsall Heath, which had originally constituted the most northerly part of the parish of King's Norton, was the first area of the county to be added to the County Borough of Birmingham, on 1 October 1891. This was followed by Quinton Urban District, which was ceded to Birmingham in November 1909, and then by the Rural District of Yardley and the greater part of the Urban District of King's Norton and Northfield, which were absorbed into Birmingham under the Greater Birmingham Scheme on 9 November 1911. Thus these areas were transferred from Worcestershire to Warwickshire. Dudley's historical status within the Diocese of Worcester and through its aristocratic links[clarification needed] ensured that the exclave was governed on a largely autonomous basis. Worcester was also self-governing and was known as The City and County of Worcester. During the Local Government reorganisation of April 1966, Dudley expanded beyond its historical boundaries and took in the bulk of Sedgley and Brierley Hill and the south of Coseley as well as a small section of Amblecote. The Local Government Act redefined its status and the County Borough of Dudley became part of Staffordshire, the county of which all of these areas had been part. At the same time, Worcestershire gained a new county borough named Warley, which was an amalgamation of Oldbury Urban District, Rowley Regis Urban District, the County Borough of Smethwick and parts of Dudley and Tipton. During these reorganisations, the area of the administrative county grew only where Stourbridge took in the majority of Amblecote Urban District from Staffordshire and[clarification needed] the designation of Redditch in 1964 as a New Town. This in turn saw expansion into the area in and around the villages of Ipsley and Matchborough in Warwickshire. The Redditch New Town designation coincided with a considerable programme of social and private house building in Droitwich, Worcester, Bromsgrove, Kidderminster and along the Birmingham boundary at Frankley, Rubery and Rednal. Frankley parish was later split into two: New Frankley and the area around Bartley Reservoir transferred from Bromsgrove District to Birmingham in April 1995; but the small village of Frankley remained in Worcestershire and became a new Civil Parish under the same name. Honeybourne railway station on the Cotswold Line and the potential Honeybourne Line. Worcestershire contains a broad expanse of green belt area, widening to over 16 kilometres (9.9 mi) in places. It is part of the larger belt surrounding the West Midlands county, and first drawn up from the 1950s. All of the county's districts other than Malvern Hills contain some portion of the belt. New Road is the home of Worcestershire County Cricket Club, across the River Severn from Worcester Cathedral. The largest and most successful football club in the county is Kidderminster Harriers. Founded in 1877 as a running club and doubling as a rugby club from 1880, the football club was founded in 1886. In 1987, the club won the FA Trophy for the first time, and seven years later reached the fifth round of the FA Cup, also winning the GM Vauxhall Conference title in 1994 but being denied Football League status as their Aggborough Stadium did not meet capacity requirements. However, when the club next won the Conference title six years later, their stadium had been upgraded and promotion was granted, giving the county its first (and thus far only) Football League members. However, the club's Football League membership was short-lived, as Harriers were relegated back to the Conference in 2005 after just five years in the Football League, and have yet to reclaim their status. The county is also represented by Worcester City of the Midland Football League, and Redditch United of the Southern Premier League. Classical composer Sir Edward Elgar was born in this house in Broadheath, Worcestershire, currently used as the Elgar Birthplace Museum. The village of Broadheath, about 10 kilometres (6.2 mi) northwest of the city of Worcester, is the birthplace of the composer Edward Elgar. It is claimed that the county was the inspiration for The Shire, a region of J. R. R. Tolkien's fictional Middle-earth, described in The Hobbit and The Lord of the Rings. Tolkien was thought to have named Bilbo Baggins' house "Bag End" after his Aunt Jane's Worcestershire farm. Tolkien wrote of Worcestershire, "Any corner of that county (however fair or squalid) is in an indefinable way 'home' to me, as no other part of the world is." Worcestershire is one of the three counties associated with the Border Morris style of English folk dancing. Worcestershire Monkey is a popular Border Morris dance; although normally performed as a group of eight, it is sometimes danced en masse with multiple Border Morris sides performing the dance together. The Worcester station of BBC Hereford & Worcester. In 2007 the Office of Communications (Ofcom) awarded a DAB Digital Radio multiplex licence for Herefordshire & Worcestershire to MuxCo Ltd. who aimed to provide several new stations in 2009, while also providing a digital platform for Free Radio, Sunshine Radio and BBC Hereford & Worcester and area extensions to United Christian Broadcasters and the Highways Agency. This multiplex eventually launched in December 2013, carrying the three aforementioned local services. In 2008, MXR, who owned and operated the West Midlands regional DAB multiplex licence, improved coverage of DAB Digital Radio across other parts of the county to include Worcester and Malvern. Services that could be heard reasonably across much of Worcestershire included: Chill, Gold (Birmingham), Magic Radio, Sunrise Radio, Traffic Radio (Midlands), BBC Radio WM, Xfm and Radio XL. However, this regional multiplex closed on 27 August 2013, reducing the number of services available in the county. Worcestershire is also famous for a number of its non-agricultural products. The original Worcestershire sauce, a savoury condiment made by Lea and Perrins, is made in Worcester, and the now-closed Royal Porcelain works was based in the city. The town of Malvern is the home of the Morgan traditional sports car. Due to its Cathedral (pictured), the county town of Worcester is the only settlement in the county with city status. Forge Mill Needle Museum at Redditch, the only remaining working needle mill in the world. Tenbury Wells with its unique Pump Rooms. West Midlands Safari Park near Bewdley. Witley Court at Great Witley – a burnt-out shell of a large English stately home, famous for its gigantic fountain, now restored to working order. Currently run by English Heritage. ^ Rogers, Simon. (18 May 2011) The ethnic population of England and Wales broken down by local authority | News | guardian.co.uk Archived 14 January 2017 at the Wayback Machine. Guardian. Retrieved on 17 July 2013. ^ Worcestershire County Council. "Worcestershire County Council". Archived from the original on 21 November 2008. ^ "A History of Dudley". Localhistories.org. Archived from the original on 10 December 2012. Retrieved 7 November 2012. ^ "County Tops". Hill-bagging.co.uk. Archived from the original on 27 September 2007. Retrieved 15 June 2013. ^ "Learning Zone Class Clips - The course of the River Severn - from source to sea - Geography Video". BBC. 1 January 1970. Archived from the original on 5 May 2013. Retrieved 15 June 2013. ^ "NAAONB Website". Aonb.org.uk. Archived from the original on 24 June 2013. Retrieved 15 June 2013. ^ "Worcester Warriors - Official website of Worcester Warriors Rugby Club". www.warriors.co.uk. Archived from the original on 27 February 2014. Retrieved 2 May 2018. Wikisource has the text of an Encyclopaedia Britannica (9th ed.) article about Worcestershire.